I love these mash-up/team-ups. Though they can be hit or miss, this one is a big hit with me. It does an excellent job of bringing the two universes together while staying true to both. 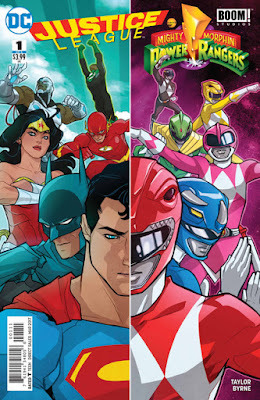 The art is well done portraying realistic DC characters and Power Rangers very recognisable with the TV show. A great story that brings together a villain from each universe. Lord Zedd and Brainiac work very well together having somewhat similar goals. A fun story with lots of action will appeal to fans of each franchise.